Relax and enjoy your evening after a delicious meal, without worrying about the washing up. 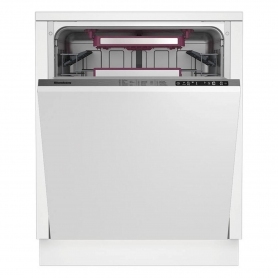 The LDVN2284 has space for up to 13 place settings, so you know you’ll have plenty of room. Fill up over the course of the day or invite friends and family over for some delicious home cooked food, without having to wash dishes by hand. Thanks to the built-in design, you can install the LDVN2284 into your kitchen units for a flawless look. The dishwasher makes only 44 dB of noise, so you’ll forget it’s even there! Adjustable feet mean the LDVN2284 is stable and steady on uneven floors. You can adjust the rear feet from the front – perfect when the appliance is installed into a kitchen unit. Running this dishwasher is also easy on the wallet. It uses less water than many other models – around 10 litres – meaning there is little waste. This model also has a fantastic A++ energy efficiency rating, helping you save money and reduce your environmental impact. Pick from eight different programmes for the perfect clean. Auto is perfect for general use, while the eco cycle uses even less energy than normal. The LDVN2284 also has a handy quick wash cycle, which is ideal when you need crockery in a hurry. Washing at 60 degrees, you can have sparkling dishes and plates in under an hour. An LCD display in the door shows programme information, and after the cycle is finished a fantastic turbo fan ensures everything inside is dry, ready to be put away. 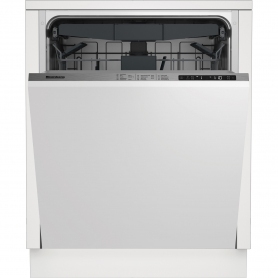 Pop a Blomberg LDVN2284 dishwasher in your shopping basket today, for hassle free washing up.